A special gift for the Montana angler or for someone who loves the beautiful fish in our rivers and lakes in our state whether they fly fish or not.. Please note: Made to order - Ships in 6 to 8 business days. 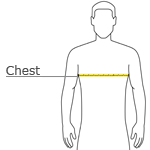 *With arms down at sides, measure from seam to seam across the upper body, under arms and over the fullest part of the chest.